Guyana’s state broadcaster- National Communications Network (NCN)- has taken the first step to begin relaying radio and television programmes across the country via satellite, a move that Prime Minister Moses Nagamootoo said is partly linked to securing the country’s sovereignty. “Guyana is ours! All of Guyana is ours-our Essequibo and the rest of Guyana- so that now we have capacity and this connectivity, as I see it, is not only in keeping with the promise made to provide information to our Guyanese people but this is securing a defence capability, a security capability because the first line of defence in a situation such as ours is the ability to communicate,” he said at the commissioning of a satellite station at NCN, Homestretch Avenue. Nagamootoo’s comments were a clear reference to Venezuela’s decades-old territorial aggression in laying claim to the Essequibo region and the Atlantic sea off that are of Guyana. Demerara Waves Online News was told that NCN’s radio and television programme would be relayed to far-flung areas across Guyana through a separate port via the same equipment being used for the Guyana Learning Channel. Several FM radio transmitters are to be located in a number of interior communities to relay mostly programmes from NCN in Georgetown. Following a change in government 10 months ago, a decision was taken to scrap paying the privately-owned TVG GYD$3 million monthly to relay the Learning Channel’s programmes across Guyana via satellite. The Prime Minister expected that the satellite transmission facility would also be used to relay activities of Guyana’s 50th Independence Anniversary to other areas of the country in a crystal clear quality. “We hope that our 50th anniversary observances- our Jubilee celebrations- will be broadcast live to all of the locations that this satellite services,” said Nagamootoo, a former Information Minister back in the 1990s. 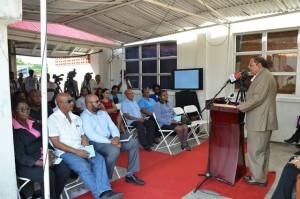 He observed that although NCN is a national broadcaster, TV viewers have been experiencing poor reception. While NCN could now pride itself as a national broadcaster, he urged the state broadcaster to guard against seeing itself as a monopoly because competitors in the industry could potentially offer the same service, with better technology at a lower cost. The Prime Minister used the opportunity to hint that government was not keen on closing down the several radio stations that had been granted 12 licences unilaterally by then President Bharrat Jagdeo ahead of the establishment of a Broadcasting Authority. “We could correct that not by shutting down those who had been wrongly given licences but by opening the airwaves and allowing the fresh air to touch our broadcasting in Guyana,” he said. Nagamootoo was quick to point out that any closure must be done by the authority. He favoured the granting of more licences for community or national radio stations and has since asked the Broadcasting Authority to approve licences to eligible applicants who have been on the waiting list for years. He lamented that many of those who were granted licences by Jagdeo lacked media experience and several of those private broadcasters were now known for “putrid” content. 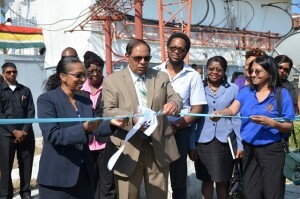 Licenses were granted to TVG, whose principal includes Jagdeo’s best friend Ranjisinghi Ramroop, Freedom Radio associated with the Peoples Progressive Party, Telcor which has since been sold to a Trinidad company, National Television Network (NTN), Maxwell Thom, Rudy Grant and several others.